When Sir Alex Ferguson left his post as Manchester United manager this past May there were two potential outcomes: Manchester United would remain in power or they would merely survive. Looks like the latter might have occurred. David Moyes took over as manager from Ferguson during the summer but was unable to exact much change into the squad. Bringing Fellaini during the transfer period was the most likely impact player for the season. There was hope that the former Everton coach might be what Guardiola was for Barcelona, a new coach to lead a team into new heights. But it was not to be, at least not right away. Right now the top four reading like this: Arsenal, Manchester City, Chelsea and Everton. This season has seen the resurgence of Arsenal, the rediscovery of Liverpool, the continuing presence of Manchester City and Mourinho's Chelsea remix. But was it really Özil's coming that lifted Arsene Wenger's Gunners and can we credit all of Liverpool's success to Luis Suarez? Certainly these are major factors, but they aren't enough to explain the current state of the league. Once there was a legend at Old Trafford; you only needed to whisper his name. 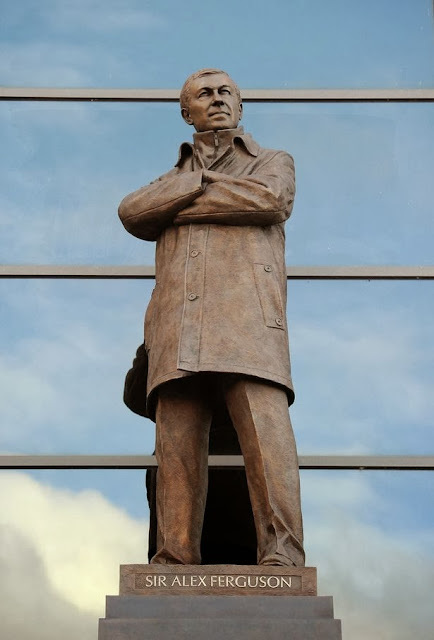 Ferguson was a constant force, a guardian of the best in English football. He was the best in the world, in reality, if we take into consideration his record. The ownership knew it and respected his decisions, the players remained in line despite their egos. Indeed, even if they crossed the boundary, personalities like Rooney and Ronaldo always relented in the end or parted ways. But the team remained on top. For opposing squads Ferguson's presence was no different. He exuded only respect and always owned the sideline. He was the X-factor that so many times won a game for United. Not too long ago, when the team was riding high--as was often the case--they were close to losing a game to a smaller team. But enter Ferguson with the right tactic and change in personnel and at the 95th minute his team had tied the score. And let's not forget Manchester United's win over Bayern Munich in the Champions league final of 1999. At the death they pulled it off. So maybe now this shroud has been lifted, so to speak, from English football. Smaller teams know they can beat Manchester United, the bigger teams aren't afraid of Old Trafford, and the players seem more concerned about their state in the league. It is up to Moyes to keep it together. United is sitting in sixth place right now, outside of all European competition. This after being a constant in Europe for two decades now. Three losses at home halfway through the season won't do it and other teams are taking note. It suffices to say that perhaps this year Manchester United will be fighting for a spot in the top four and will need to stave off Everton, Liverpool, Tottenham and Newcastle to reach the fourth place. Will Moyes bring in real reinforcements? A player like Cristiano Ronaldo might do the trick but then again there is something else missing, a mystical quality. They are beatable, they can be weak, they struggle, they lack Sir Alex Ferguson. They say that rain forests gain terrain, sunlight and freedom when the biggest and oldest trees die. Can we say the same about the Premier League?